Happy Monday! I hope you are enjoying your three-day weekend to the fullest. Due to the freezing rain we didn’t go out much this weekend, other than to drop off Arianna for a playdate on Saturday and go out for dinner afterwards. 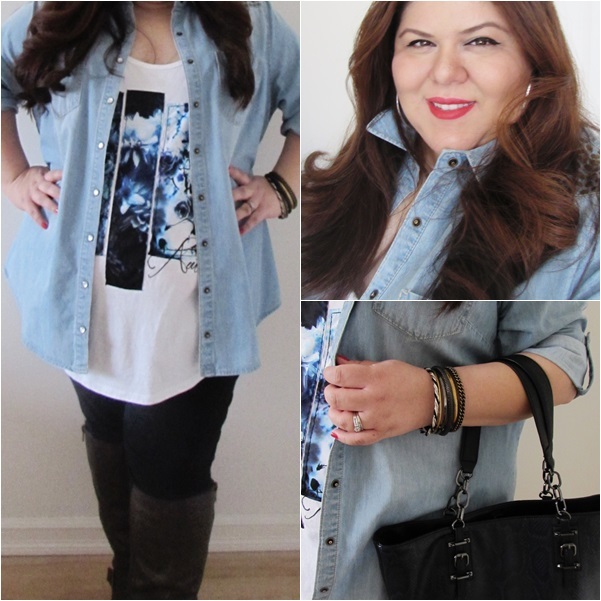 A casual weekend called for a casual outfit, so I layered a Lane Bryant floral tank under a Democracy chambray shirt, paired it with some black skinnies and boots, and called it a day. My outfit also happen to pair perfectly with a Simply Vera Wang faux snakeskin tote the hubby recently gifted me so I was happy to put it to some use. Have a great week and stay warm out there! I'm so sick of this awful weather! We stayed indoors the entire weekend. At least you got to go out to dinner. The perfect look for a casual weekend, chic and comfy - love it. Don't hate me but it's 65 degrees in Nashville today. It won't last, not in January, so I'm enjoying it while I can. Hello Jenny and thank you for making Share-in-style richer with your style. Perphaps you could add a mention to Share-in-Style next time, so people get to know us and the family will grow. Love this look! Perfect for running around and still looking chic! I LOVE This... I totally need to put a graphic under a denim. Thanks girl for the inspiration. Love for you to link up with #realmomstyle. Your hair looks great! What sort of products do you use? I make sure to use shampoo for color-treated hair, do a hair mask (store bought or homemade) every two weeks or so and I use styling oil (most recently macadamia) after styling hair.